Here at Capital Automotive Group, we’re always happy to help you find your next new or used car, but our commitment to our customers doesn’t end there. We also offer repair and maintenance services at each of our locations. Whether you need an oil change, a minor dent or scratch buffed out, or a major collision repair, you can trust the skilled technicians here at Capital Auto Group. Our service team is certified to perform warranty service and all maintenance and repair tasks on Chevrolet, Buick, GMC, Cadillac, and Ford vehicles, and we’re happy to handle any issues with other vehicles as well. Our service centres include Universal Collision Centre and Capital Auto Glass, so we can make sure your car looks as good as new, and runs just as well, whatever the issue may be. Feel free to connect with Ford Lincoln Regina, GMC Buick Cadillac Regina, Ford Lincoln Winnipeg, GMC Buick Edmonton, or Chevrolet GMC Buick in Calgary, about your service and repair needs. You can also schedule a service appointment online now at the service centre of your choice. Capital Automotive Group is your go-to automotive sales and service provider serving Saskatchewan, Manitoba, and Alberta. We have an inventory of high-quality new and used cars that drivers want, and to make finding the perfect vehicle for your needs easier than ever, we are happy to transfer vehicles between our locations at no charge. Since there’s guaranteed to be something in our multi-province inventory, why not get started and take a look at our inventory today? Our new car inventory includes cars from top automakers like Ford, GMC, Chevy, Buick, and Cadillac. Whether you’re looking for a hard working truck, or a luxurious sedan or coupe, there are models to meet your needs and taste. We also offer a large inventory of used cars for sale, so you should be able to find a vehicle for any budget and preference. One reason that Capital Auto Group provides a different kind of shopping experience is the fact that our customer service team isn’t paid on a traditional commission system, so you won’t experience the pressure to buy like you might at other dealerships. We also offer a unique, 15-day, no-hassle exchange policy, and a 45-day full warranty program on used cars, so you can feel confident when you drive home in a vehicle from Capital. Here at Capital Auto Group, we’re here to help you find the car you need, and one part of that process is providing financing. We make it easy to get the auto loan that you need. All you have to do is apply online for pre-approval right now. We can find the best rates for you from local and national banks, as well as utilize in-house financing. 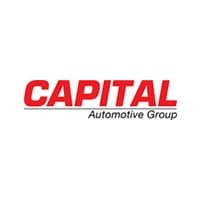 Capital Automotive Group has locations in Edmonton and Calgary, Regina, and Winnipeg. Visit one of our locations to browse our inventory and find your next car, or contact us online with any questions. Experience one of the best dealerships in Canada!